But the episode there is already subbed, no softsubs for this. Or just join them. It's a very friendly community^^ Or was, I read it's closed permanently?? I found his stage plays in LJ, in Oguri Downloads community, and Caligula at Veoh, but except to As You Like It, that has italian subs (I'm italian ) the rest of plays are raws. I'm most interested in Caligula, can anyone tell me if there's subs for it? Italian, English, Spanish, French... It doesn't matter!!! has anyone found out about the movie that is coming out...he directs it i think? Was it any good? For me the preview made it seemed interesting. esmer86 wrote: has anyone found out about the movie that is coming out...he directs it i think? Was it any good? For me the preview made it seemed interesting. "Popular young actor Shun Oguri (27), who just made his directorial debut with the movie "Surely Someday," will next be working on a voice acting role in an animated series. He has been chosen as the lead in NTV's "RAINBOW - Nisha Rokubo no Shichinin," set to start on April 6. "RAINBOW" is an adaptation of the acclaimed manga of the same name, written by George Abe and illustrated by Masasumi Kakizaki. Serialized over a period of eight years, the comic ended last month. Its first 21 volumes have sold more than 3 million copies, and the final volume comes out this weekend. The story depicts the lives of six young delinquents at a special reform school in 1955. Oguri plays the protagonist Mario, while actress Shihori Kanjiya (24) plays the main female role. Other characters are being voiced by Rikiya Koyama, Romi Paku, Takaya Kuroda, Keiji Fujiwara, and Tatsuya Hasome. Megumi Hayashibara will serve as a narrator. Oguri has done voice acting before, including the main character in "Wangan Midnight," but this will be his first lead voice role in an anime on terrestrial television. I don't know, but it's one of the animes in this season that i wanted to see. score is pretty high, so it must be good. Hm, synopsis looks good (violence, that's good ), but I have to see it with my own eyes (and hear it, hehe). I heard from my sister that's the anime is good. Takeshi Kitano, Sou Kuramoto team up for drama special "Kikoku"
Talento Takeshi Kitano (63) and screenwriter Sou Kuramoto (75) are teaming up for a TBS drama special that will air this August. Titled "Kikoku," the drama will star Kitano and feature a cast of big names, including Shun Oguri (27) and Maki Horikita (21). "Kikoku" is based on the 1955 short story "Saipan Kara Kita Ressha," written by the late author Hiroshi Muneta. Kuramoto originally adapted it last year for a theatrical version, but he is writing a new script for the drama. The fantasy story starts when a unscheduled train arrives at Tokyo Station, carrying the ghosts of a group of soldiers who died honorably during World War II and dropping them off in present-day Tokyo. Kitano plays one of the soldiers, a private first class, who visits his younger sister, but he becomes violent upon witnessing her current misery. Oguri plays a former musician who was sent to war, leaving behind his girlfriend Yoko (played by Horikita). When he returns to see her, 60 years have already passed. Kaoru Yachigusa will play the older Yoko. Other cast members include Takashi Tsukamoto, Osamu Mukai, Yoichi Nukumizu, Yuya Endo, Katsuhisa Namase, ARATA, and Koji Ishizaka. TBS plans to air the drama on August 14, the day before the anniversary of Japan's surrender. Whoa, it seems pretty interesting! Definitely i'm going to watch. Kikoku, wanna watch it ! there are a plenty of Oguri's dramas in my waiting list ><"
Shun's movie Surely Someday premiered on the 17th and Shun got thrown into the air my the cast: Hope his movie will do well. There's also a video on youtube. Shun was the "Aniki" guest on this week's Arashi ni Shiyagare 07.24.10. The episode was fun to watch. and you’ll understand two lovers debating the virtues and woes of war, of leaving and being left behind, and of love coming to an end. On the other hand, the scene is timeless and effective that’s why it has become a formula and staple of any movie depicting wartime no matter which war, no matter what era. The scene is made even more poignant by the splicing of scenes of the old Kasai Youko walking through the empty house as though chasing the ghost of a memory while the ghost of Kitani looks on. Then old Kasai Youko started talking to the ‘ghost’, I’m guessing about what happened to her after the Americans came, how she lost her eyesight, and, I guess, why she never fell in love again (no family photos). By the end, it became sort of a Cinderella thing where Kitani had to leave before sunrise, I suppose, so he tells her goodbye once again and, maybe, regrets of having left her, and of course that he loved her. The way old Kasai Youko said “Sayonara” and closed the piano underscored the heartrending end of their love story. Shun here is so Hanazawa Rui with his classical music (cello instead of violin). At the same time because of the presence of Maki, I was reminded of Sano Izumi as well, except as Kitani he was sympathetic and never grunted at all. Yachigusa Kaoru (old Kasai) looked really good for an 85-year-old, as well as that guy who got killed in his office. I mean if he was old enough to affect a WWII soldier’s life enough to get himself killed by its ghost then he must be at least 80 years old. I saw that it’s also going to be adapted as a stage play. I remembered thinking that in the earlier scenes when the officer brought Kitani and Kusaka to the concert hall. Speaking of that scene, too bad Mukai Osamu's story wasn't developed so much -- well I think it wasn't developed so much because I didn't get a lot from the gist (he was an artist and his model was his lover and the painting he made of her now hangs in a museum). Of course it didn't help that I didn't understand the dialogue but as I said in the case of Shun and Maki, body language tells as much of the story as dialogue does. Like I got that Oomiya's sister got embroiled in the sleazy side of dancing because, I assume, of that dude who got killed in his office that's why Oomiya's ghost killed him. All three of them (the dude, Oomiya and his sister, the old lady who died in the hospital) got their closure in the end with the flight of the white birds. All in all, the experience of watching Kikoku specifically Shun and Maki's story line, was haunting and sad especially if you don't (or can't because of the language barrier) take into consideration all the political, social and moral implications pertaining to Japan's involvement in that particular war. Last edited by tunix_2008 on Aug 15th, '10, 09:54, edited 1 time in total. Aww, I've been waiting for Kikoku but keyhole was acting up for me and i couldn't get any audio for large parts. So I stopped and decided to wait for an upload. Do you know whether there's a group that's gonna sub this, or maybe japanese subs? Thanks for your outline. Maybe you could put your summary under a spoiler tag, just in case some peeps don't like to read about the story before watching it. Yeah, KeyHole was a bit troublesome during the whole broadcast but I stuck to it thinking there might never be a chance to see it. Tanpatsu's like these rarely get uploaded much less subbed. Although Maki fans might be so inclined to subbing it since they do for all Maki's projects but I haven't read anyone promising to upload or sub. ^ wow! I hope that it will be confirmed soon. Thanks! Has anyone got a utorrent link for this.We have subbers waiting to sub this but I can't a video to upload.Thanks. 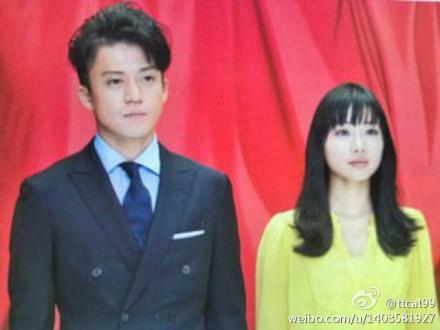 It is now confirmed that Shun Oguri (27) and Mao Inoue (23) will co-star in a new drama series this fall. The pair, who appeared together in the live-action "Hana Yori Dango," have been cast in an adaptation of "Juui Dolittle" ("Veterinarian Dolittle"), a manga written by Midori Natsu and illustrated by Makiyoshi Chikuya. Well I'm not expecting much from a Sunday night drama about a love-triangle between vets and an animal nurse...but I do have faith in Shun's and Nari's skills (and looks). Found a little chara chart, seems the nurse has a crush on Dolittle's rival, Hanabiji (Nari) but the arrow's only one way and says 'awsome'...And the arrow from Nari to Shun says "why are you like that?" Hehe I soo hope for Dolittle to be a real weirdo (cause it's Shun) and for some hilarious bickering between those two. arakira wrote: Well I'm not expecting much from a Sunday night drama about a love-triangle between vets and an animal nurse...but I do have faith in Shun's and Nari's skills (and looks). Why the hell is Oguri Shun not Riku... Hayashi Kento's acting is so stiff in Arakawa. It looks like Hinata Tooru will be a character, who earned a lot of money by his internet website and started to don't trust any people because he thinks they only want his money. Sawaki Chihiro meets him because of something job related, realizes he's not such a bad guy as he may look like. Have you guys seen how great he was in Summer Snow? Just fantastic! I have yet to see Rich Man Poor Woman, though. Oguri Shun is my favorite Japanese actor. I was shocked when I heard that he got married a few years ago. I can stop dreaming about Hanazawa Rui now . Soooo could you recommend me another shun's dramas/movies please? He was also in Kyumei Byoto 24 ji season 3, Woman and starred in Tokyo Dogs (with Yuriko Yoshitaka). These are some of the more recent ones I watched and his acting was great; but I thought he really stood out in the supporting roles because those dramas were outstanding (Kyumei and Women).